At A Glance Classic Disney Main Street store. 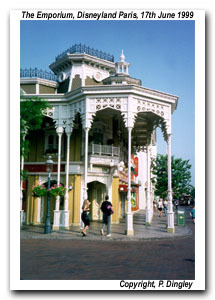 The Emporium is a 19th century styled department store on the left of Main Street, and as with the other theme parks, is one of the main anchor buildings on Main Street USA. In theming the store the imagineers have even included an overhead cable-driven money exchange system that serves the cashier's office. The Emporium specialises in selling designer Disneyland Paris clothing, jewellery, Disney character souvenirs, and in deference to it's location outside of the USA, Parisian souvenirs.